Though an elapid, a relative of the cobras, this brown and yellow snake looks more like a viper. Thus, the highly poisonous Death Adder has the short, stout body and triangular head often associated with vipers, yet it has well-fixed fangs in the anterior part of its mouth as do other elapids. Though more than 60 percent of the species of Australian snakes are venomous elapids, they are not particularly common. The absolute percentage is one of those statistics that causes people to shudder, particularly people from North America, where most species and most specimens encountered are likely to be harmless. 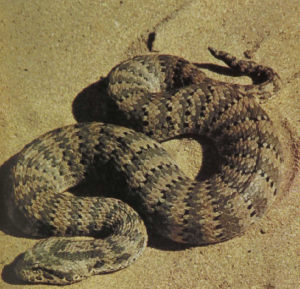 The absence of true vipers in Australia apparently allowed for specialization of some elapids, like the Death Adder, into a viper-like manner of making their living. Probably these thickset, short-bodied elapids (up to 3 feet) could not compete with more specialized vipers elsewhere.